Map My Walk is an app designed to track the route you take whilst walking - it measures distance, calories burned and can also help you measure your weekly progress. Daily Workouts FREE is a great 5 to 30 minute daily workout routine for you! Lark, your personal weight loss coach. Get unlimited personal guidance and support, anytime, anywhere. Your Lark Coach watches out for you. We believe — and medical studies prove — that the best way to lose weight and keep it off is to simply keep track of the foods you eat. Find out more about your local leisure centres in Croydon. A charity supporting disabled people of all ages and abilities to enjoy the benefits of cycling. Check out the courses and community development available from the Crystal Palace Football Club Foundation. Check out your local walking routes in Croydon. 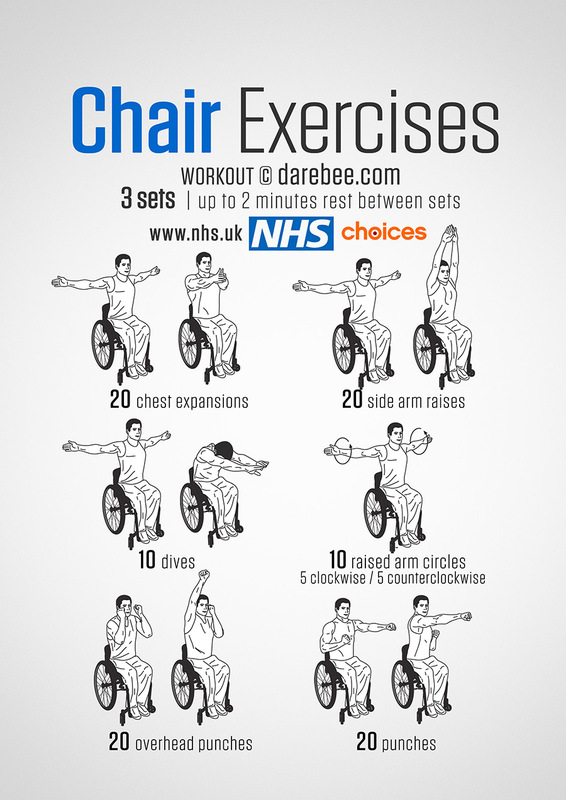 A range of exercises for wheelchair users. Check out these quick 5 minute workouts to start your day with! Check out these work outs that you can do from your own home. Check out this 12 week fitness plan for overall health - with weekly outlines of activities you can complete. A five week strength and flexibility work out plan. Check out this exercise plan which gradually builds up your running distance, all the way up to 5K. Check out some ideas for balance exercises for older adults. Check out some ideas on flexibility exercises for older adults. Some practical examples of how older people can improve their strength through exercises. Check out these tips on how to incorporate activity into yours and your family's lifestyles. Read the recommended amount of physical activity that older adults need to stay healthy. Find out how much exercise young people should be getting every day. Find out the recommended physical activity guidelines for your children. Sedentary or inactive behaviour can have a negative impact on your health. Find out how on this website. Why should you be active? Check out what exercise can do for you and your health. If you are unsure of how much physical activity you should be doing per week, take a look at the NHS guidelines. Would you like to join a group of regular runners? Pop along to your local Park Run - for all ages and abilities. Get the facts on how being active can have huge benefits on your heart and overall health. Gentle exercise for elderly adults can have huge health benefits and improve mobility. Got 10 minutes to spare? Why not give one of these work outs a go - these can even be done at home. Here are some quick tips and advice on how you can lose weight. From little changes in what you eat to the different types of activity you can do, see how other people have lost weight. It's recommended that adults take 10,000 steps a day to maintain good physical activity levels - can you complete the 10,000 steps challenge? It can be difficult to find the time to do some exercise, but exercise does not always have to mean going to the gym. Here's a quick 10 minute workout you can do in the comfort of your own home. Couch to 5K helps you to become active at a managable pace. As well as creating a plan for you, the Couch to 5K app can motivate you while running, so why not give it a go! Motivational music for running or exercising. Useful everyday tips and advice for overall health and wellbeing. Freakonomics - What’s the best exercise? Are you unsure what type of exercise to do? Listen to this podcast for some interesting tips. Do you struggle with motivation to exercise? Check out this podcast on willpower and how you can combine exercise with doing other things you enjoy. Couch to 5K sets up a weekly running plan using motivational podcasts, which acts like your own personal fitness coach.